Shell encountered more than 244m of net hydrocarbon pay in the Mississippi Canyon Block; exploration update Gulf of Mexico Basin, offshore USA. Map showing location of the original G33166 1 wellbore in the Mississippi Canyon Block, offshore USA. 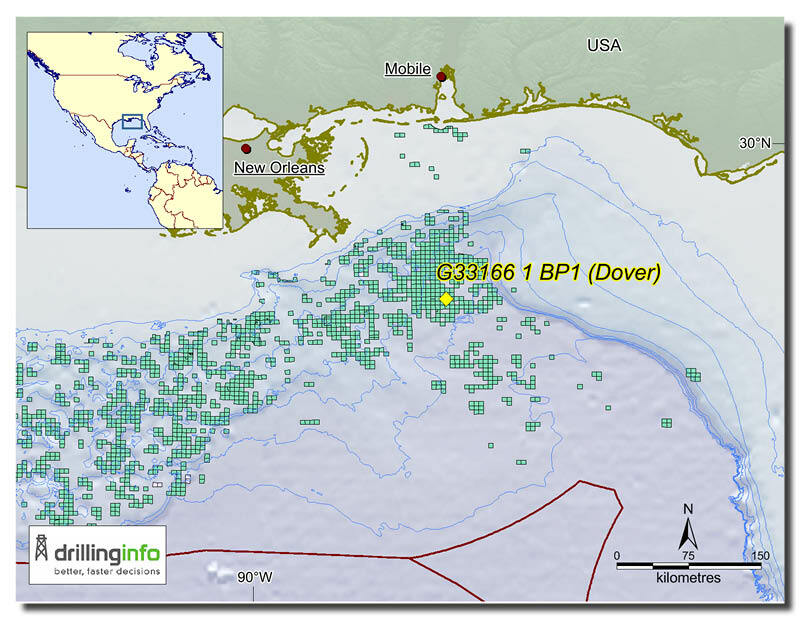 Shell encountered more than 244m of net hydrocarbon pay in bypassed G33166 1 BP1, a new field wildcat which was targeting the Dover prospect in the Norphlet play, according to reports in late May 2018. The bypass, which was kicked off on March 23, 2018, is located about 21 km from the Appomattox host, which is expected to start production before the end of 2019, and is considered an attractive potential tieback to it. The original wellbore, G33166 1, was spudded in late February 2018 and drilled to a final TD on March 11, 2018. Both wellbores were drilling from a surface location in the eastern portion of Mississippi Canyon Block MC 612 in the Gulf of Mexico Basin in water depths of about 2,500m. The Dover discovery is Shell’s sixth in the Norphlet. In early March 2016, Shell had submitted plans to drill a total of four exploration wells in Mississippi Canyon Block 612. The lease was awarded to Shell as operator and sole interest-holder in August 2009. Sam Cheyney, Simon Campbell and Ian Somerton, Getech. Experts from Getech have been addressing the challenge of deriving a globally consistent depth-to-basement map and have devised an approach which accounts for the obstacles of variable data resolution and types, irregular constraints and different geological settings.